IEEE Electron Device Lett., 38, 5, 2017. S. M. Sze and K. K. Ng, “Physics Of Semiconductor Devices”, 3rd ed. New York, NY, USA: Wiley, 2007. J. M. Larson and J. P. Snyder, “Overview And Status of metal S/D Schottky-Barrier MOSFET Technology,” IEEE Trans. Electron Devices, vol. 53, no. 5, pp. 1048-1058, May 2006. B. Rajasekharan, R. J. E. Hueting, C. Salm, T. Van Hemert, R. A. M. Wolters, and J. Schmitz, “Fabrication And Characteristic Of The Charge-Plasma Diode,” IEEE Electron Device Lett., vol. 31, no. 6, pp. 528-530, Jun. 2010. 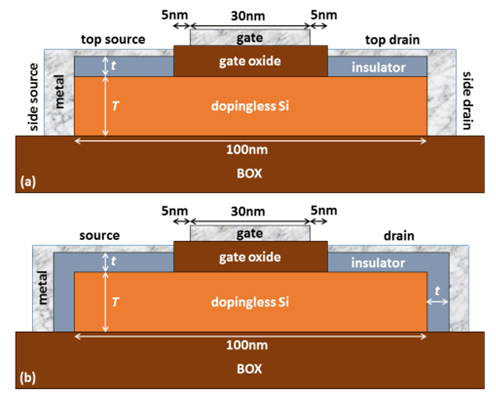 M. J. Kumar and S. Janardhanan, “Doping-less Tunnel Field Effect Transistor: Design and Investigation,” IEEE Trans. Electron Devices, vol. 60, no. 10, pp. 3285-3290, Oct. 2013. C. Sahu and J. Singh, “Charge-Plasma Based Process Variation Immune Junctionless Transistor,” IEEE Electron Device Lett., vol. 35, no. 3, pp 411-413, Mar. 2014. C. Sahu and J. Singh, “Potential Benefits And Sensitivity Analysis Of Dopingless Transistor For Low Power Applications,” IEEE Trans. Electron Devices, vol. 62, no. 3, pp. 729-735, Mar. 2015. F. Bashir, S. A. 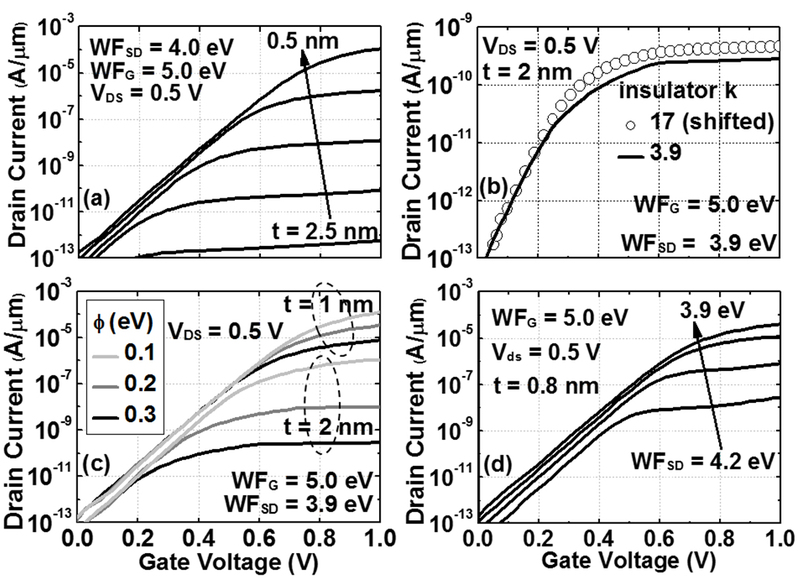 Loan, M. Rafat, A. R. M. Alamoud, and S. A. Abbasi, “A High-Performance Source Engineered Charge Plasma-Based Schottky MOSFET On SOI,” IEEE Trans. Electron Devices, vol. 62, no. 10, pp. 3357-3364, Oct. 2015. A. Dimoulas, P. Tsipas, A. Sotiropoulos, and E. K. Evangelou, “Fermi-Level Pinning And Charge Neutrality Level In Germanium,” Appl. Phys. Lett., vol. 89, no. 25, p. 252110, 2006. D. Connelly, C. Faulkner, P. A. Clifton, and D. E. Grupp, “Fermi-Level Depinning For Low-Barrier Schottky Source/Drain Transistors,” Appl. Phys. Lett., vol. 88, no. 1, p. 012105, 2006. M. K. Husain, X. V. Li, and C. H. De Groot, “High-Quality Schottky Contacts For Limiting Currents In Ge-Based Schottky Barrier MOSFETs” IEEE Trans. Electron Devices, vol. 56, no. 3, pp. 449-504, Mar.2009. V. Heine, “Theory Of Surface States,” Phys. Rev., vol. 138, p. A1689, Jun. 1965. W. Mönch, Electronic Properties Of Semiconductor Interfaces, New York, NY, USA: Springer, 2004. T. Nishimura, K. Kita, and A. Toriumi, “Evidence For Strong Fermi-Level Pinning Due To Metal-Induced Gap States At Metal/Germanium Interface,” Appl. Phys. Lett., vol. 91, no. 12, p. 123123, 2007. M. Kobayashi, A. Kinoshita, K. Saraswat, H.-S. P. Wong, and Y. Nishi, “Fermi Level Depinning In Metal/Ge Schottky Junction For Metal Source/Drain Ge Metal-Oxide-Semiconductor Dield-Effect-Transistor Application, ” J. Appl. Phys., vol. 105, no. 2, p. 023702, 2009. A. M. Roy, J. Y. J. Lin, and K. C. Saraswat, “Specific Contact Resistivity Of Tubnnel Barrier Contacts Used For Fermi Level Depinning,” IEEE Electron Device Lett., vol. 31, no. 10, pp. 1077-1079, Oct. 2010. A. Agrawal, J. Lin, M. Barth, R. White, B. Zheng, S.Chopra, S. Gupta, K. Wang, J. Gelatos, S. E. Mohney, and S. Data, “Fermi Level Depinning And Contact Resistivity Reduction Using A Reduced Titania Interlayer In n-Silicon Metal-Insulator-Semiconductor Ohmic Contacts,” Appl. Phys. Lett., vol. 104, no. 11, p. 112101, 2014. H. Yu, M. Schaekers, K. Barla, N. Horiguchi, N. Collaert, A. V.-Y. Thean, and K. De Meyer, “Contact Resistivities Of Metal-Insulator-Semiconductor Contacts And Metal-Semiconductor Contacts,” Appl. Phys. Lett., vol. 108, no. 17, p. 171602, 2016. J. Borrel, L. Hutin, O. Rozeau, M.-A. Jaud, S. Martinie, M. Gregoire, E. Dubois, and M. Vinet, “Modeling Of Fermi-Level Pinning Alleviation With MIS Contacts: N And pMOSFETs Cointegration Considerations-Part I,” IEEE Trans. Electron Devices, vol. 63, no. 9, pp. 3413-3418, Sep. 2016. Sentaurus Device, Synopsys, Inc., Mountain View, CA, USA,2013.